This is a true story of something that happened just a few years ago at USC. There was a professor of philosophy there who was a deeply committed atheist. His primary goal for one required class was to spend the entire semester attempting to prove that God couldn't exist. His students were always afraid to argue with him because of his impeccable logic. For twenty years he had taught this class and NO ONE had ever had the courage to go against him. Sure, some had argued in class at times, but no one had ever *really gone against him* (you'll see what I mean later). Nobody would go against him because he had a reputation. At the end of every semester, on the last day, he would say to the class of 300 students, "If there is anyone here who still believes in God, stand up!" In twenty years, nobody ever stood up. They knew what he was going to do next. He would say, "Because anyone who believes in God is a fool. If God existed, he could stop this piece of chalk from hitting the ground and breaking. Such a simple task to prove he is God, and yet he can't do it." And every year he would drop the chalk onto the tile floor of the classroom and it could shatter into a hundred pieces. All of the students could do nothing but stop and stare. Most of the students were convinced that God couldn't exist. Certainly, a number of Christians had slipped through, but for 20 years they had been too afraid to stand up. Well, a few years ago there was a freshman who happened to enroll in the class. He was a Christian, and had heard the stories about this professor. He had to take the class because it was one of the required classes for his major. And he was afraid. But for three months that semester, he prayed every morning that he would have the courage to stand up no matter what the professor said or what the class thought. Nothing they said or did could ever shatter his faith, he hoped. Finally, the day came. The professor said, "If there is anyone here who still believes in God, stand up!" The professor, and the class of 300 people looked at him, shocked, as he stood up at the back of the room. The professor shouted, "YOU FOOL! If nothing I have said all semester has convinced you that God doesn't exist, then you are a fool! If God existed, he could keep this piece of chalk from breaking when it hit the ground!" He proceeded to drop the chalk, but as he did, it slipped out of his fingers, off his shirt cuff, onto the pleats of his pants, down his leg, and off his shoe. And as it hit the ground, it simply rolled away, UNBROKEN. 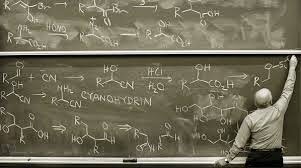 The professor's jaw dropped as he stared at the chalk. He looked up at the young man and then ran out of the lecture hall. The young man who had stood up proceeded to walk to the front of the room and share his faith in Jesus for the next half hour. 300 students stayed and listened as he told of God's love for them and of his power through Jesus.